If you are looking for jobs working from home, or if you have dreamed of making money from the internet, please take time to read the following advice from MrKent who has experience dating back to 1995. My daughter-in-law recently paid $99 to sign up for an online offer to make money from the internet while working at home. She hasn't made much use of it yet because she has been pre-occupied trying to get a refund. You see, they billed her credit card twice. So instead of costing $99 it has cost her $198 and she hasn't earned a penny. When I first got involved with the internet and started mrkent.com I wanted to succeed as rapidly as possible. I found a deal on the internet which claimed they would place my site on 1500 search engines and make sure it rated high enough to be found on one of the first three pages. I paid them $149.00 of my hard-earned money but never saw any of the promised results. My wife, Beth, works at home after she returns from working at her regular job. And she makes a nice income sewing dresses to fit Cabbage Patch dolls. She usually spends a couple of hours making each dress and sells it for anywhere from $12.00 to $16.00. Anyone who has a skill like that can make money working at home. Unlike many of the promotions we see on television and the Internet she will never earn thousands of dollars per month doing what she loves to do. I retired and began receiving Social Security a few years ago. So, I also work at home - maintaining this website. I began programming as a hobby in 1982 and have worked at Internet providers and schools teaching it. Now, I get to work at home earning between two and three dollars per hour putting together Internet resources that benefit folks like yourself. But it didn't happen over-night. 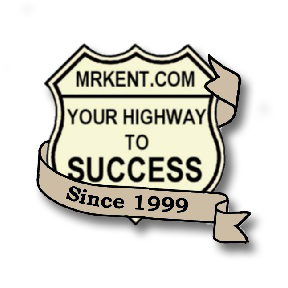 Mrkent.com was started way back in 1995 and has slowly grown to what it is today. You can do the same if you have time and some ideas. Basic web programming is not difficult. You will find, as many of us have, that the Work At Home And Make Lots Of Money schemes do make money - but just not for you! There are a lot of scams out there that will take advantage of the person willing to work for a living. If you think you have found a work-at-home opportunity that looks promising be sure to check with the Better Business Bureau, and review the online blogs and forums before giving them your money. Be advised that work is WORK, whether it be at home or away from the home. If it sounds too good to be true it probably is.